ToyWiz recent put up a listing for a series of Mega Man "3D Figural Keyring" figures. The line consists of ten trading figures sold in individual blind packages. 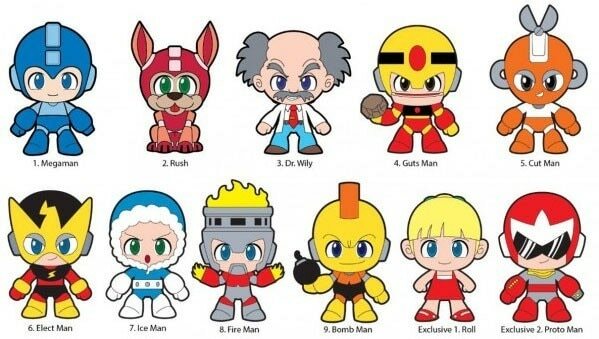 Characters include Mega Man, Rush, Dr. Wily, Guts Man, Cut Man, Elec Man, Ice Man, Fire Man, Bomb Man, Roll, and Proto Man. The usual suspects, basically. There's no images of the actual figures themselves at this time. However, if you want an idea of what these guys might look like, check out this video on Disney Figural Keyrings. The Mega Man line is expected to hit stores this October. More keychains? And where’s the love for the other Mega Man games? We’ve only gotten bosses from Mega Man 1 it seems. The Loyal Subjects seems to be taking it in the right direction. I bet if the Retro Roto Series were to come back in some sort of way, it would actually sell this time! After the d-arts and 4inch nel currently, that would have to be pretty decent to impress anyone. and ofc only MM1 Robot Masters pandering. I don't mind trying getting one of those though. well, as the "Original Generation" they act as sort of mascott for the serie as a whole, and they're the more emblematic. So of course, when they want to do any robot master, they do theses one. My patience for the merchandising is beginning to wear thin again, even with MM11 eventually coming up. >x>;; I hope if these do well we get MM2 next.